← Working Hard but Customers don’t Appreciate? 3 Reasons Why. When Satan had successfully lured Jacob into his net through trickery in Genesis 27, the drama had only begun. Instead of Jacob repenting and apologizing to his brother Esau, he went deeper in sin by running away to avoid facing the wrath of his brother. God met up with him in Genesis 28 as he was running away in sin instead of running way from sin. You may wonder why it is that when you sin you get caught before you have even enjoyed the sin yet others do the same sin for years and they do not get in any trouble. It is because God will not allow a man or woman of destiny to be destroyed by the devil before fulfilling their destiny. Satan knew that God had chosen Jacob to be the Patriarch of Israel and it was this destiny he was fighting. But God interrupted this party. 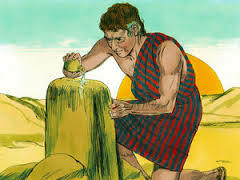 After meeting God, Jacob built a monument in the form of an altar and anointed it. He did not build an altar at the time he tricked his brother or when he decided to run away. He built an altar when he met God. A monument signifies a place you want to remember, a place you want to go back to, a place you are connected to. Many of us, after we have experienced failures or when we fail to resist temptation in moments of weakness, we want to build monuments there so that we dwell on our failures and go to town about how cunning the Devil is. We even feel we have an obligation to remind people of their past sins, without realizing that we are building a monument to magnify and celebrate the devil’s achievement. We ought to be like Jacob who built his monument at the time he met God in order to magnify God, whose grace and outstretched arm took him out of the miry clay and set his feet upon the rock. This was the same monument in Bethel that he went back to for worship in Genesis 35. Let your coming back be to God’s grace not to your past mistakes. Warriors do not celebrate defeats but victories. As soldiers in the army of the Lord, let’s not continue building monuments for Satan by continuing in sin. When the devil reminds you of your past mistakes, remind him that at least you have a chance to repent while he lost his chance. When someone labels you by your past mistakes, embolden them to build a monument for God not the Devil. Like Jacob who became Israel, let’s build our monument upon God’s redeeming grace in Christ Jesus and anoint it with the oil of the Holy Spirit because we are Spiritual Israel. Glory Be To God. This entry was posted in Social Service ( Home, Family, Community), Theological Service (Church) and tagged altar, anoint, Bethel, birthright, Jacob, monument, oil, Spiritual Israel. Bookmark the permalink.